...from a new computer! Yes I finally took the plunge and spent my tax return on a snazzy new IMAC G5! GULP! I always get the jitters with a new expensive visitor like this, but we are getting aquainted and I think it likes me. I made a wee birdy bag as a gift for a not be be named yet friend, so it stays a surprise! Boy it was a brain twister making it lined, even with a tutorial. It is not quite right, so I have to do some practising, but I like it fine. I bet once I find out the trick, it will be a snap. Here is one of my Target buys form Detroit last week. I could have made it myself, but the apples!! I couldn't NOT get it with those pink apples calling my name. Plus, it was only $9.99. ... a button maker! Here are some sneak preview buttons which will be in the shop sometime. So exiting! My family all chipped in. Thank you family! It has been a busy morning, I had to renew my business liscence which had expired without my knowing sometime last year. I got called on it when I tried to use it to get tax off my computer purchase. Doing that online was not as horrifying as I expected. It seems even though I have the same internet connection (lowest DSL), the new computer makes everything faster! It's funny, I always made all my pictures on the blog 4 inches wide, becasue my old computer - the beloved blue IMAC G3- only had a weeny small screen. Now this new guy is jumbo sized - 14.5". Everything looks tiny! I got my modbird trade from Lisa! Isn't she cute? Thanks Lisa! Congrats on the new computer! You'll love it!!! I envy your button maker... cool! hooray for new macs!!!! so glad you had a wonderful birthday, the 30's are going to rock, you'll see! and that apple bag??? i must go to target this afternoon! oooh, a button maker, tell me more: where did you get your hands on one of those? I am in need of button maker too. When I was at fabricland the other day, there was the cutest fabric that looked like it was designed by you. Are you doing fabric design now? Who wouldn't love some birdy curtains? i love the little coin purse and the bag and the buttons! wow! i can't wait to get my t-shirt! Yeah! You got a button maker too! Congrats on the new addition to the house (the computer, of course!)...wow!! Enjoy your modbird--she's lovely! I love the birdy bag! Did you design the fabric or did you find it? It's so fabulous! For this weeks illo friday I think I should draw me looking at your new G5....ENVY and your button machine and the American Target...Australian Target is no where near as cool...I might double check the teatowel section today. Cute bag! I love apple prints. Where did you find the tutorial you talk about in the beggining of the post?... if it was on the internet, could you give me the address to it on my flickr page please?... 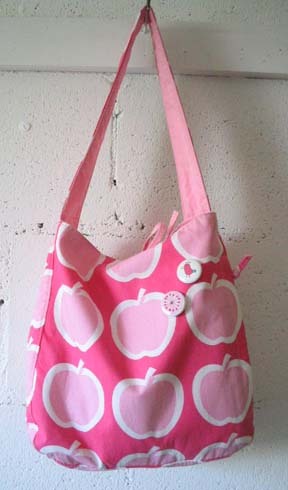 the apple bag is co cute! thanks all! so many changes! well, not really, it does take time to get used to the new mac though! but i know thimbles is better!! Oooh - lucky you - congratulations on your shiny and beautiful new toy! (I'm still typing here squinting at my teeny G3 imac screen feeling a teeny bit jealous!) Love your birdy bag, too! love the shirt you sent her! very cute! It was me!! I received the pouch! I'm so lucky to be the un-named friend! THanks Tania!